While we cannot be certain, he probably wouldn't join forces with the American Freedom Defense Initiative, which recently plastered public transportation in various cities with hateful posters calling Muslims savages. Just a guess based on his track record! "Our country is in the midst of a lot of divisions," Temple Emanuel Senior Rabbi Joe Black said. "Hatred is only going to further violence and the breakdown of society." The "Love Thy Neighbor" message conveys "a shared concept in the three religions," Colorado Muslim Society Imam Karim Abuzaid said. "In Islam, we are commanded to love our neighbor, or at least act in love." 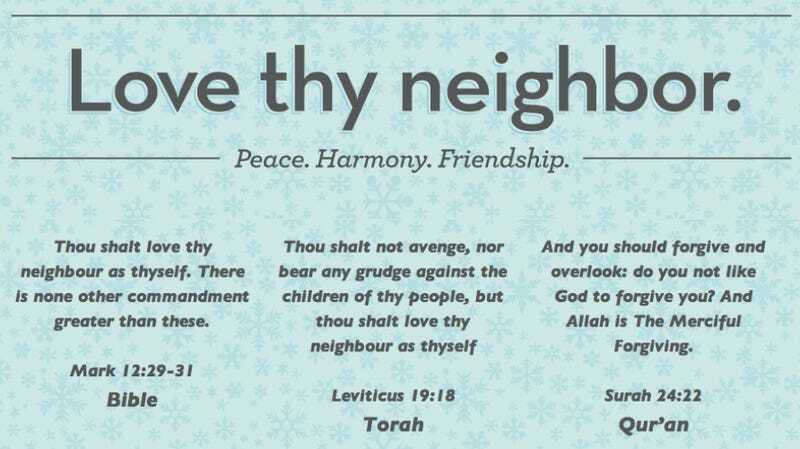 The "Love Thy Neighbor" ads are slated to appear on 10 buses by the end of this week and will stay up for a month.